On February 9th, 2017 the SPC Softball team took on Warner University at Eddie C. Moore sports complex. The Titans squeaked out a game 1 victory 2-1, and had another narrow margin win in game 2 3-1. In Game 1 SPC found themselves down 1-0 early, but managed to come back in the 4th inning. Sophomore Alyssa Price hit a line drive between 2nd and 3rd base which led to both of the runners on base to score giving the Titans the 2-1 lead which ended up being the final score. Game 2 started eerily similar to game 1, with Warner taking an early led. Unlike game 1, however, the Titans were able to regroup and recover in the same inning. 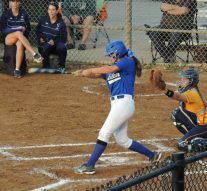 Sophomore Victoria Wilkins hit the sacrifice pop fly to allow sophomore Brianna Strickland to score the tying run. In the bottom of the 3rd inning, sophomore Keeley Mayers hit a home run right down the foul line to break the tie and give SPC a 2-1 lead. Sophomore Victoria Wilkins wanted in on this home run action, so late in the 6th inning Wilkins crushed the ball straight into the middle of the field and over the raised green wall. Player of the night: Sophomore Victoria Wilkins stepped up big for the Titans Thursday night in game 2 with an RBI (Run Batted in) to tie the game, and a home run to add to the lead. Play of the night: Sophomore Keeley Mayers demonstrated amazing flexibility at 1st base by making a catch and the out while in a full split.